Non-cat owners are baffled by it. Almost every cat lover I’ve known has completely and implicitly understood it, and accepted it without question. The details and specifics may vary from cat lover to cat lover and from home to home … but almost every cat household I’ve known has some version of it. If you have a cat on your lap, you get to keep sitting down. In fact, you’re obligated to. In our home, we call it “feline paralysis.” Or “FP” for short. And it dominates our daily household arrangements to a degree that even we recognize is absurd. The encatted person gets waited on hand and foot: food and drink are brought, dishes are carried away, electronic communication/entertainment devices are fetched. The disencatted person gets stuck with any and all household tasks that demand immediate attention. 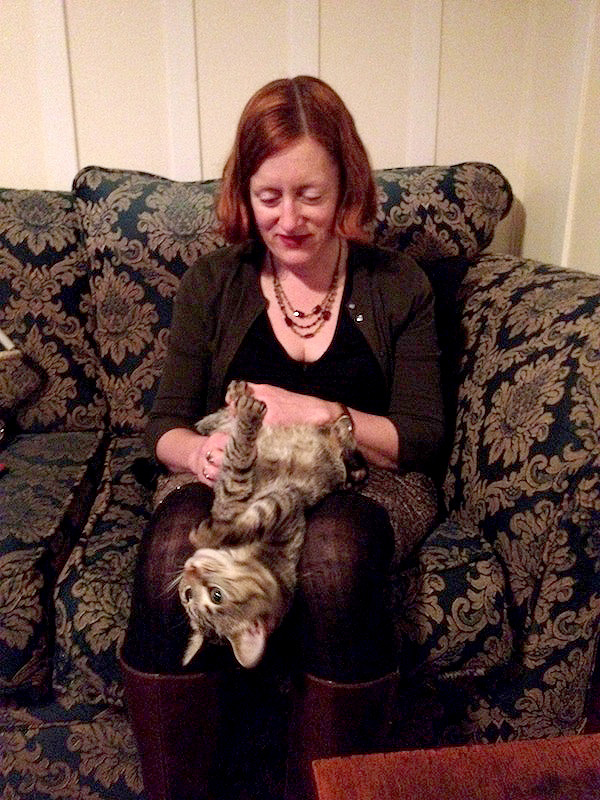 We do realize that, from the non-cat-lover’s perspective, this behavior might seem a bit … extreme. Deranged, one might even say. We’ve blown off plans we’ve made for the evening, because we both had cats on our laps. (Not really important plans — but still.) Yes, we arrange our lives around our cats’ pleasure to an absurdly high degree. 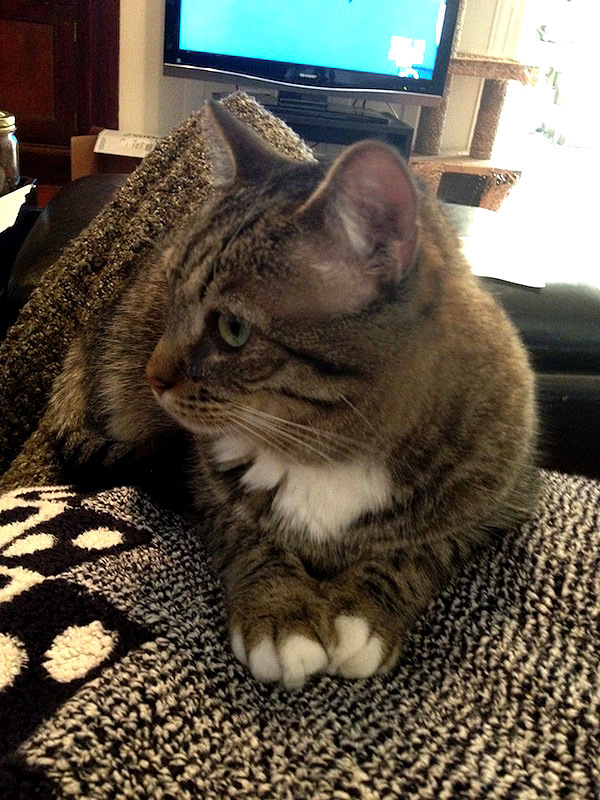 On the other hand … we get to have cats on our laps. So there’s that. Like so many fundamentals of human virtue, this simple principle becomes more complicated when it plays out in the real world. As any philosopher will tell you, ethical questions become most interesting when fundamental and deeply held values collide. And so it is with feline paralysis: The simple and fundamental value of cats sitting on laps can become deeply complicated when it conflicts with the values of keeping commitments, fairness in allocation of household duties, or really needing to pee. So here are the rules of feline paralysis, as we have fleshed them out in our household. 1. It is not acceptable to push a cat off one’s lap for anything other than appointments, emergencies, going to work, or really needing to pee. 2. It is, however, acceptable to entice a cat to voluntarily leave one’s lap. If one of us has a cat on our lap, it is acceptable for the other to get up and go to the kitchen… knowing that the cat will think we’re going to feed her — and then leap off the lap in question. 3. If one of us has a cat on our lap, the other person has to do any household tasks that require getting up. 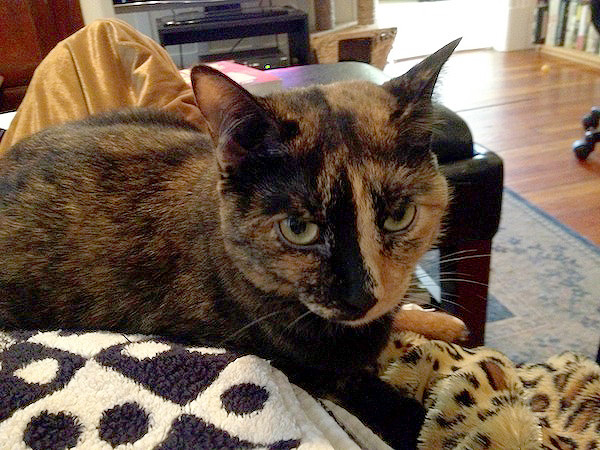 Answering the phone, taking dishes to the kitchen, switching the laundry from the washer to the dryer, fetching chocolate … whoever doesn’t have a cat on her lap is automatically responsible for all of it. 4a. Any cat who has been to the vet that day gets lap priority. Ditto for any cat who has to be medicated. 4b. If both of us are encatted, but one of us has two cats on her lap, the doubly-encatted one gets Feline Paralysis priority. 5. In cases where dislodging a cat from a lap is absolutely necessary, a lap transfer from one lap to another must be attempted. It is understood that this rarely works — but a good-faith effort must be made. 6. We do not referee feline disputes over a lap. If one cat is on a lap, and another cat horns in on her space, we let nature take its course. 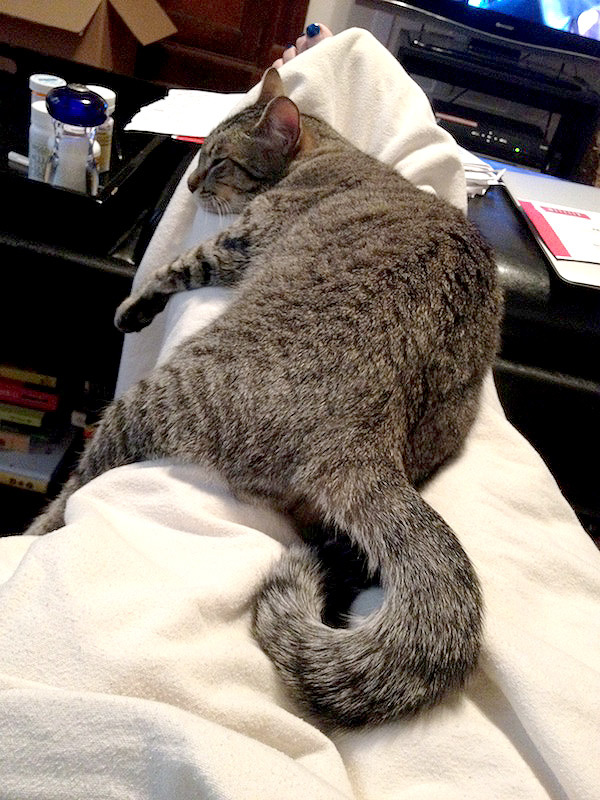 What are the rules of Feline Paralysis in your home? What do you call Feline Paralysis in your home? Do you even — I shudder to think, but I must consider all possibilities — not abide by any rules of Feline Paralysis? Do you not, in fact, prioritize the sitting of cats on laps as a fundamental principle around which your entire life is arranged? Let us know!